This has definitely been my go-to night out outfit this winter. This dark blue, lace dress has been a favourite in my wardrobe for events such as my work's night out to 18th birthday parties. The dark blue material brings a wintery vibe to the outfit, and the lace detailing around the stomach and sleeves make it the perfect girly, going-out attire. 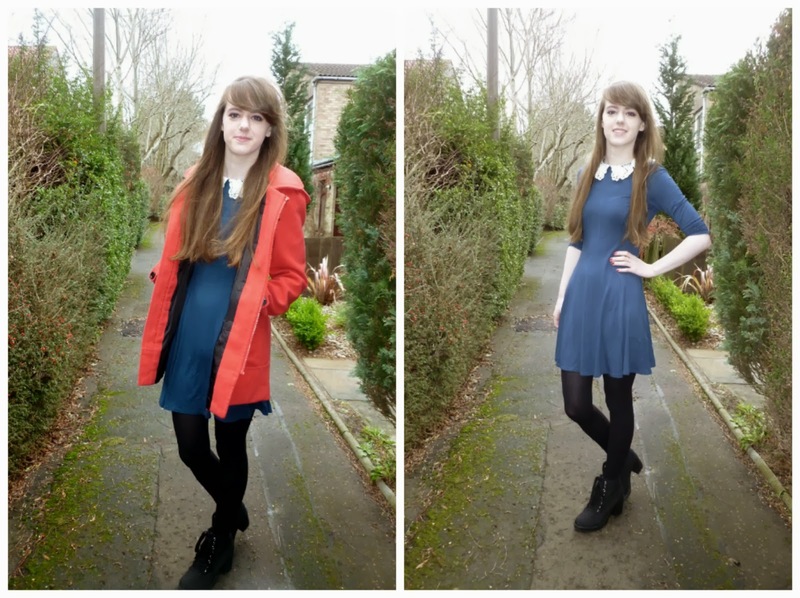 As it is very chilly in Scotland to go out with only the dress on and shoes, I paired the dress with an old, cosy black blazer from Primark, black tights and black heeled shoes. This is the last part of my Winter Lookbook series - please let me know what your favourite outfit was and if you enjoyed it. I definitely want to blog more outfits in the future, I had a lot of fun with this series. To view Part Three, click HERE. Unfortunately, during the Winter months, our skin is battered with many factors; chilly climates, forceful winds and dehydration from blasting the heaters too high at home. This can leave your skin looking and feeling very dull, and in need of a moisture boost. 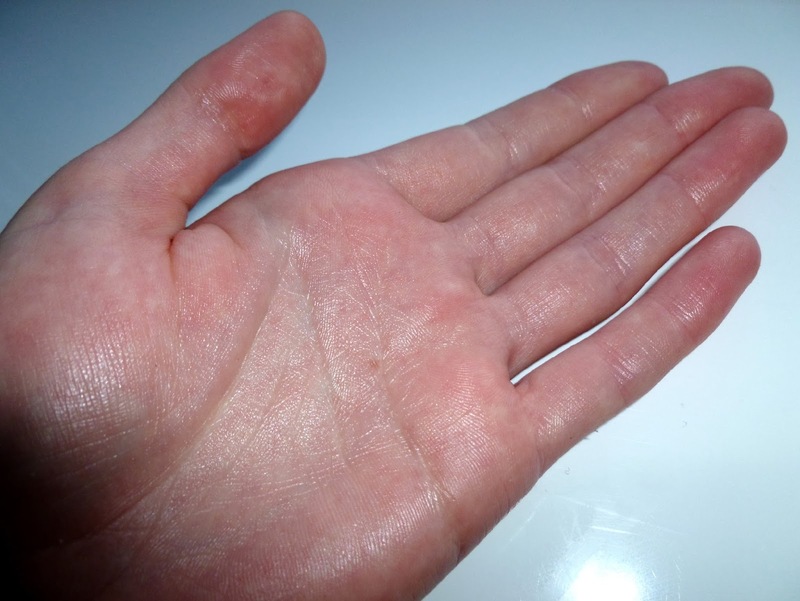 I find my hands are the driest during the winter season, and I'm proud to announce I've found a product that has helped hydrate my skin and protect my hands throughout the day. "Gloves In A Bottle is a shielding lotion that rapidly absorbs into, and bonds with, the outer layer of skin creating a protective layer while retaining the natural moisture from within. This makes it the perfect dry skin care product." Most hand creams I've tried usually tend to focus on moisturising the skin, however, Gloves In A Bottle also focuses on protecting your hands from getting dry and chapped in the first place. Basically, it claims to let in the 'good stuff' and stop the 'bad stuff' from sinking into the skin by providing a protective layer around the skin (for all the technical bits, visit www.glovesinabottle.com). The consistency of the cream is surprisingly quite runny and has a glossy sheen to it, making your skin look both silky and moisturised. I was a little concerned the lotion would wear off after washing; as daily tasks such as dunking hands into cleaning products or even washing up the dishes can have a damaging effect of the skin. Amazingly, it doesn't wash off! I found there was no need to worry about reapplying the product too often either, as it naturally wears off when your skin cells exfoliate (this happens around every 4 hours). Gloves In A Bottle is also greaseless. The main reason I tend to steer away from applying lotions is because I'm very lazy when it comes to waiting for products to dry, I want a lotion that is quick drying and allows me to carry on with my day almost instantly without having to flap my hands dry for ages. This product really does dry almost instantly and doesn't leave that horrible greasy feeling; my hands felt moisturised and silky without feeling slimy. I don't have severely dry or irritated skin, but after scanning through reviews on the internet, it seems apparent this product has worked wonders for those with skin conditions such as dermatitis or eczema. It's not surprising the product has had a benefit on sensitive skin as it is fragrance-free, hypoallergenic and non-toxic which means it is gentle on the skin without irritation. Not only is it great for treating dry hands, it can be used all over the body, so there's only one product you need to treat all areas! Gloves In A Bottle is available in a handy 60ML travel size as well as a large 240ML size with a pump dispenser. Prices vary depending on the retailer, but the lotion is very affordable for wonderful results. Gloves In A Bottle is widely available at high street Pharmacies as well as independent Pharmacies too. Today's outfit is a little more dressy for a typical Sunday. I love mixing my plain, black and white striped tshirt dress with an army camo jacket on top. I think it breaks up the simple colours and adds something interesting to an outfit. I also added a red, cosy cardigan underneath as it was a little chilly outside. Adding a bold scarf also helps to add a pop of colour without drawing too much attention away from the staple pieces of the outfit. 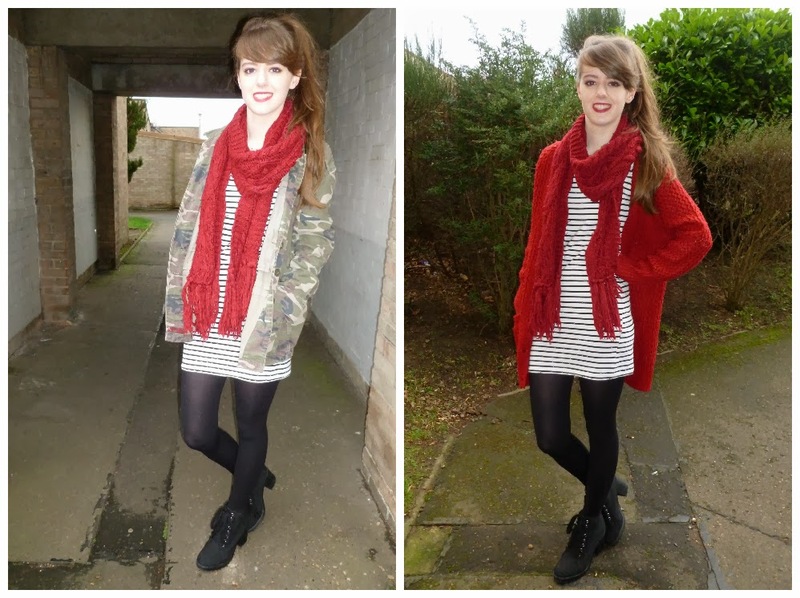 I'm also wearing my favourite boots at the moment from Matalan, they were also featured in part one of my lookbook series. 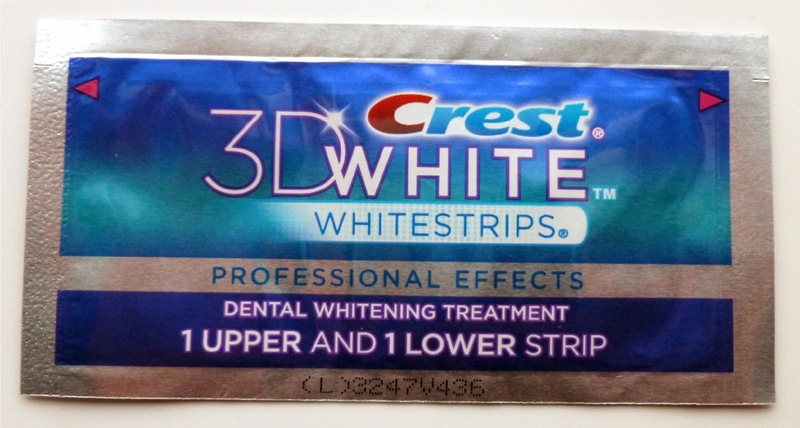 I started whitening my teeth early this year after getting my hands on Crest 3D Whitening Strips. I've heard of a lot of good reviews online, so I bought them on eBay (as you can't currently buy them in the UK, boo!). I've tried lots of whitening kits from Pharmacies and supermarkets, but none of them match up to the results I get from American brands. Bearing in mind I am not a professional, these are only tips on how I like to whiten my teeth (remember to ask your dentist before buying whitening products). Try not to brush your teeth with toothpaste before applying the strips. The fluoride from the toothpaste can interact with the chemicals in the strips, thus making it not as effective. Instead, brush your teeth with toothpaste a few hours in advance and then brush them with only a wet toothbrush half an hour before applying. I will brush my teeth after dinner, then again without toothpaste before I apply the strips. I find brushing before opens up my teeth's pores, allowing the whitening to be more effective! The Crest strips I use have advanced seal technology, which allows them to stick securely to your teeth without sliding around during the process. However, if you're using another brand, you might find they won't stick onto your teeth as well. A trick I've found helpful, is using my dental retainers (the clear ones you are given after braces) to keep the strips in place. It actually works pretty well, considering the strips are fairly thin, the retainers fit comfortably on top. If you're finding that the strips hurt your teeth after use, try using them every other day instead of daily. I have sensitive teeth, but I find if I have a day off whitening, my teeth are fine to whiten again two days after. Don't worry about the whitening process, it doesn't really matter if you don't use the strips daily like advised. It won't make a difference to how white your teeth will be at the end. After use, instead of using a toothbrush to get rid of the residue, try only washing your mouth out with water. Brushing your teeth around the period you whiten your teeth can make them very sensitive and brushing off the residue can reduce the effects of the strips. I like to apply the strips before bed so I can gargle water afterwards and sleep to let the chemicals do their magic. Have you whitened your teeth before? What are your tips? Today's outfit is very casual and focuses more on layering. I'm wearing a red, oversized checked shirt with a plain grey jumper on top. 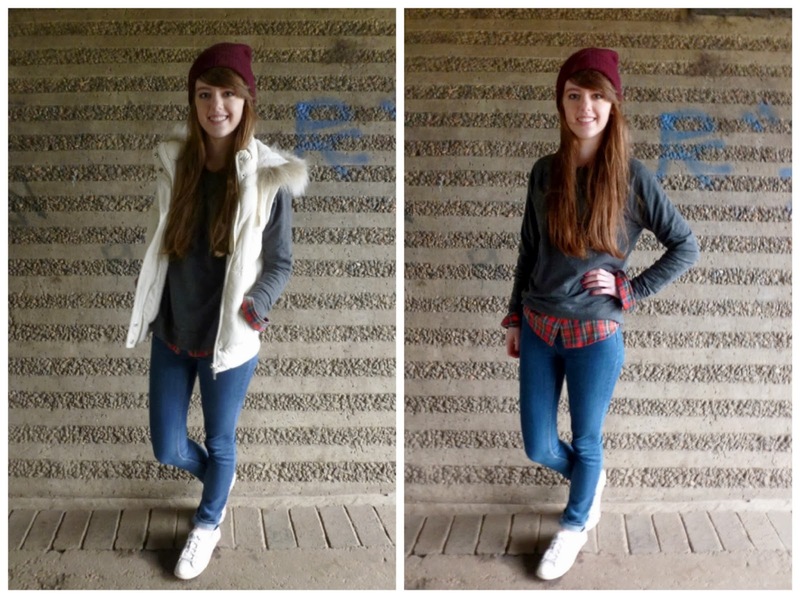 I teamed this with my comfiest blue jeans (Primark's ultra soft super skinny jeans are amazing!) and a pair of white converse. I was doing errands today before University starts again tomorrow and it was a little chilly outside, so I threw on a white body warmer and a hat to keep me warm. I've owned my Shu Uemura eyelash curler for a good few years now, and it's still going strong. 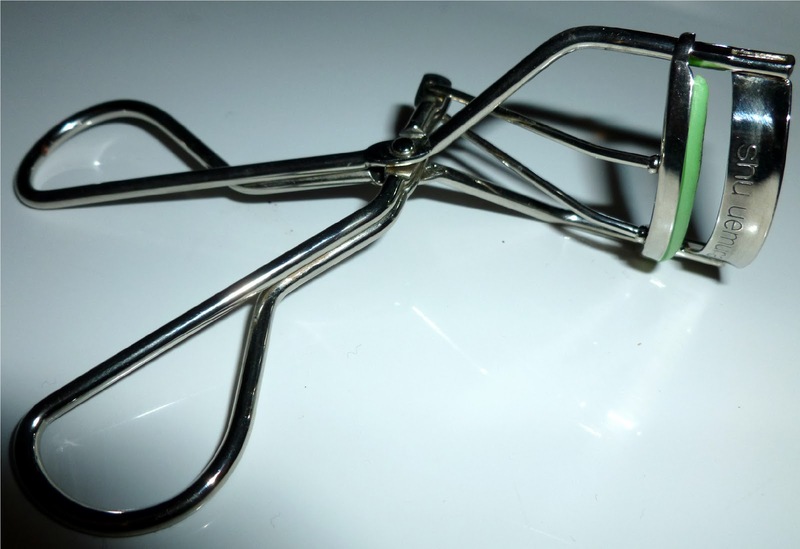 They're going for a RRP of £20 in Harvey Nichols, however, I've come up with a few tips for you to make the most of your eyelash curler without breaking the bank. Firstly, there are a lot of genuine Shu Uemura curlers floating about on ebay; just make sure the seller is receiving good feedback and do your research on them before buying because I have, unfortunately, bought a couple of fake pairs in the past. 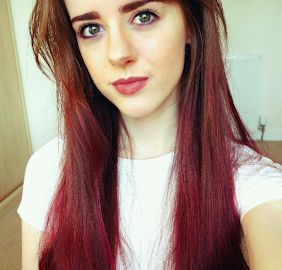 I bought my curler a few years ago for £5 or £6. 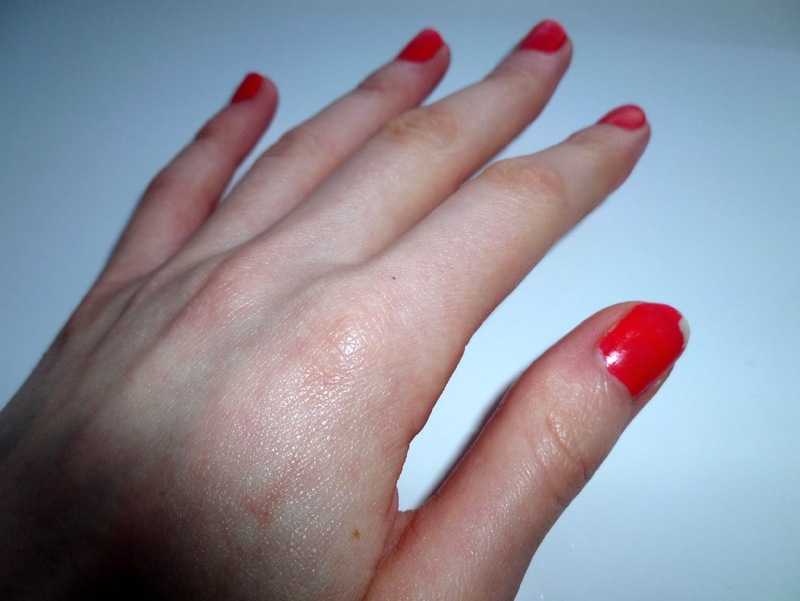 Instead of opting for an electronic heated curler, blast a normal eyelash curler with a hairdryer for 5 seconds. I do this everyday and it's the best trick to keep your lashes curled all day (You can see a before and after shot of my eyelashes in my recent eye make-up routine HERE). I've tried a few electronically heated curlers in the past and I haven't come across one that works well with my lashes! 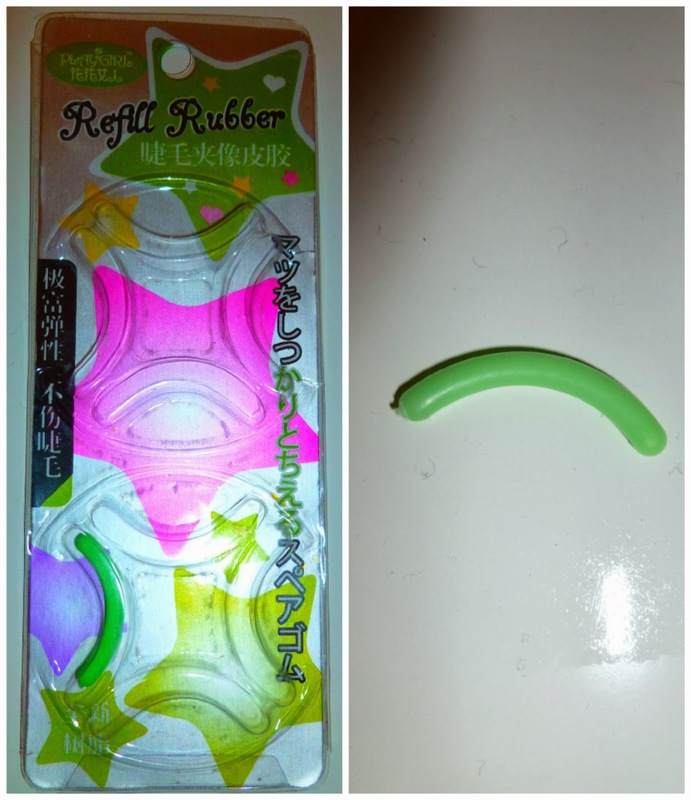 Next, instead of buying a whole new eyelash curler every time the rubber splits or buying expensive packs in the shops; eBay sell great refill packs that cost only a few pounds! I bought a pack of 8 for £2 last year and they're great quality- I only need to change the rubber once every 6 weeks. Don't worry about sizes, most eyelash curlers have the same rubber size. I hope you found this post helpful and let me know if you try it out! I'm going to be starting a little Winter Lookbook series. A new outfit will be posted every Sunday for four weeks! The outfits will range from smart evening looks to casual on-the-go outfits. I hope you enjoy this series. For today's outfit, I'm wearing my favourite teal coloured dress with a crochet collar and a bright red jacket (which I've owned for years) on top. I'm also wearing a pair of heeled boots I picked up last week which were only £20! I love this outfit as it's really comfy and still looks great at the same time.